Satan finally tested Jesus’s sense of significance and value. 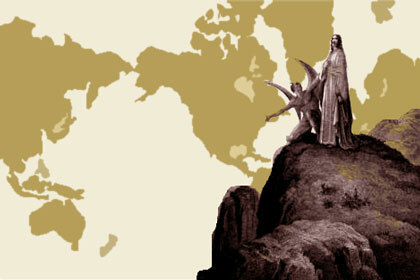 Look at all the kingdoms of the world. Are you really “all that” Jesus? Any insecurities in there, Jesus? Will the world really fall to you? Can you really pull this off, Jesus? I don’t think you can make it… It’s going to be really hard, Jesus. I can help you out… With another indirect shot at the Father, Jesus is given an easy way out. Bypass all the struggle, all the suffering, and skip all the rejection. I can make you big NOW and ensure that everyone will follow You… This could be a considerable test for Jesus. While not walking in His former omniscience at the moment, I’m sure Jesus had a pretty good idea at that point what was ahead for Him. The coming mission was not going to be all Renn and Stimpy (y’know, “Happy happy! Joy, joy!”). He felt tired… hungry… thirsty… weak… No. Jesus knew, and acted on the truth, that the kingdoms of the world and their splendor would be given to Him, but not because He did things the easy way; not because he went the quick-success/not too much suffering way. Not because He went Satan’s way. Jesus knew that His significance, His value, His importance, and His success was all because He trusted His Father and obeyed. Only the Father is worthy of being worshipped and obeyed, regardless of the personal consequences. Period! And so Satan left the Son of God alone, because there was no more to be tested. Jesus had trusted His Father in His weakness and affirmed that all of Who He was and all that He needed was in the Father. So let it be for us! !